Ask the average person what their top 5 arcade games of all time were, and it’s likely (if your audience is as old as I am) that Donkey Kong will be included right behind Pacman. 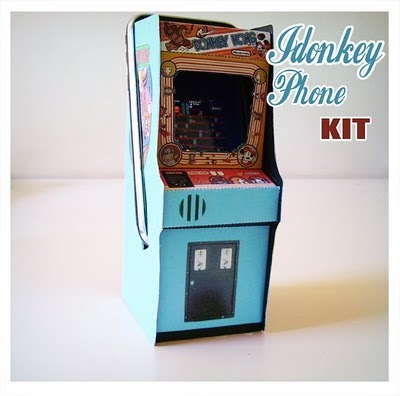 So, naturally, that explains why we see so much cool gear around here, and why someone would make a DIY miniature donkey kong iphone arcade machine that doubles up as an iPhone dock. I have to say considering it’s made mostly out of paper (I believe, considering the original post is from little paper life), it’s an impressively geeky little gadget. Now it would only work with an iPhone without a protective casing, so you’ll need to dispatch your favorite flower cover before hooking it up, but still, a replica of a classic arcade game and an Pphone dock all in one? The concept could be applied to an innumerable number of other original games as well. Personally I’d like to park my iPhone into a Golden Axe arcade game replica. I’ve probably wasted too much time and way too many quarters on that game, but damn was it fun! Now if you’re looking to pick up a donkey kong iPhone arcade machine if you’re own, well, apparently you can’t get one just yet since this is a prototype of what could be put into production. They certainly have my vote, but then there seems to be a lot of geeky stuff featured here on Walyou that’s one of a kind. You can’t go around picking up miniature arcade games that are powered off an asus netbook, now can you? I don’t think they’re quite ready to mass produce Pac man arcade games made out of legos, either. Still if nothing else it serves as inspiration for those of us out there with the inclination to make something geeky and fun at the same time. I still want that lego arcade machine…but something tells me I don’t have enough legos to go around.